Hairstyling today has gone from simple to complex where new techniques and procedures are being carried by hairdressers in order to achieve that unique modern look that makes men and women appear more attractive. Hair colouring has been practiced for many years using traditional chemicals such as the typical dye and a bleaching agent called peroxide. This method is still being used today in many beauty salons however, a newer method known as balayage is also introduced. In the next passages, you will find out everything you need to know about this popular technique. Balayage is a hair colouring technique introduced by French experts during the 1970’s. As opposed to the traditional highlighting technique using cap or foil, balayage is applied by hand. Although balayage applies best to hair below the shoulders, it also can be done to the shortest pixie crop hair. As such, balayage is then more common to women than men. That makes beauty salons flocked by many female customers. Natural highlights can be achieved in different ways. You can either opt for soft and subtle effects to strong and punky style. Hair highlights is actually a low maintenance enhancement which you can do to hair because you don’t need to visit the salon every two weeks for a touch up. As your hair grows longer, the highlights remain in place making you feel good and attractive over time. In this case, balayage is great idea for those who hardly have the time to enter a salon more often. Since, balayage does not require frequent salon visits, then you can save a lot on your hairstyling budget. Despite having your hair grow for another month or so, still, your hair won’t look atrocious. This is the case for as long as balayage is done correctly. Once you enter the best hair salon in Melbourne for balayage, you can just come back for a simple hair treatment after a few months. The balayage process is done in different formats depending on the hair length and desired result. 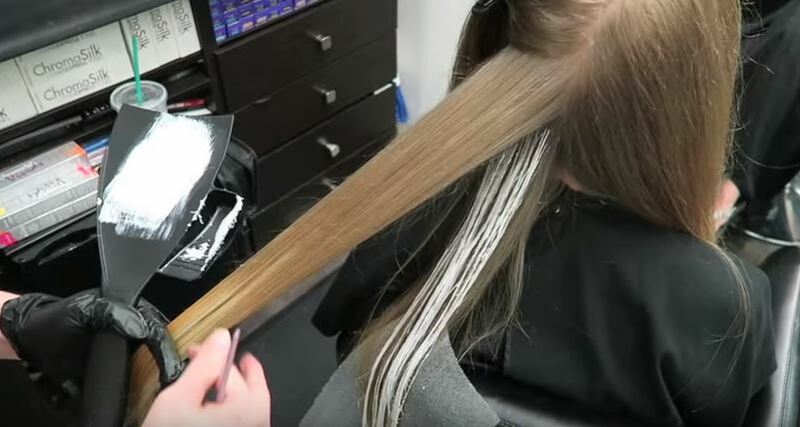 Experts would either colour individual strands using a brush and a backing board or they would divide the hair in sections with foil or cotton wool. Another method is by teasing the hair in sections and then colour the ends in a freehand way. Balayage experts can always recommend the best colour and technique that fits your hair type and history. For serious clients who like to maintain their balayage in its best appearance, a minimum of three appointments is needed to completely build up the colour desired. It is important that each appointment six weeks apart so that the hair don’t get damaged. At this point, you could go as far as four months without balayage application. All you need to have is a toner and a hair treatment such as hot oil or hair spa to freshen up your hair colour. There are actually no boundaries whether or not balayage is fit for you. In fact, this colouring technique is best done on natural virgin hair. Although chemicals are applied to your hair, there is no reason to fret because different treatments are available to keep your hair smooth and vibrant. The good thing is that you can practice these inexpensive hair techniques at home with the use of over-the-counter salon items or natural products. For those whose have been living with coloured hair, balayage is still a great choice of hair enhancement. Actually, this would alter a big difference in your dull hair especially if you have been using one colour for a long period of time. Balayage really makes a huge change in every woman’s crowning glory. Balayage is finished best with loose curls or some tousled beachy look where a variation of colours cascade through the hair. For sharp, strong haircuts such as bob cut, block colour or stronger colour are required in order to show off the cut. In a nutshell, balayage is best on long flowing hairstyles. Whether balayage is done at home using balayage tutorial or in a professional salon, there is a need to undergo hair treatment after. Given an interval of six weeks to two months, hot oil, hair spa and other conditioning methods must be carried out. This is to maintain the moisture and softness of the hair from root to tips. Should you notice dryness on the tips of your hair, consider a trim to take off the edges and then enhance further with a conditioning cream, hair protein products or serum. All these can be purchased in beauty salons or cosmetic and hair care stores. Grab advice from hair care expert and you will surely get the most accurate treatment. Balayage is an innovative technique which can bring your hair style to a different level. For as long as a professional hair colourist handles your hair, sure you will love the results.